NASA photographer Joel Kowsky combined 10 frames combined create this composite image of the International Space Station — with six crewmembers aboard — transiting the sun at about five miles per second on Dec. 17, 2016. Talk about being in the right place at the right time! 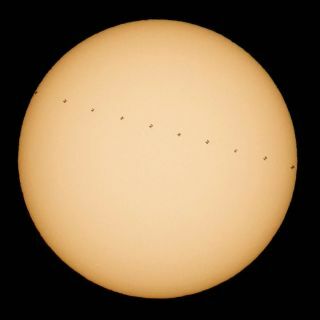 NASA photographer Joel Kowsky captured this composite view of the International Space Station — the largest manmade structure in space — as it crossed in front of the sun earlier this month. Because of the space station's immense size (it's as long as a football field), it can be easily spotted at night by stargazers with clear skies and who know when and where to look. But NEVER try to spot the space station crossing the sun with your unaided eye, as severe eye damage can result. Photographers and astornomers use special protective filters to safely observe the sun. You can find out where the space station is in the night sky with our handy Satellite Tracker widget here, courtesy of N2YO.com. NASA also has a Spot the Space Station website that can help you find out when the space station will fly over your location. The space station is currently home to six Expedition 50 crewmembers: Americans Shane Kimbrough and Peggy Whitson of NASA; Russians Andrey Borisenko, Sergey Ryzhikov, and Oleg Novitskiy of Roscosmos; and French astronaut Thomas Pesquet from the European Space Agency. Expedition 50 began Oct. 30 and is scheduled to end March 4, 2017. During Expedition 50, the crew will perform biotechnological research, human research as well as Earth and space science. The expedition may include two spacewalks.